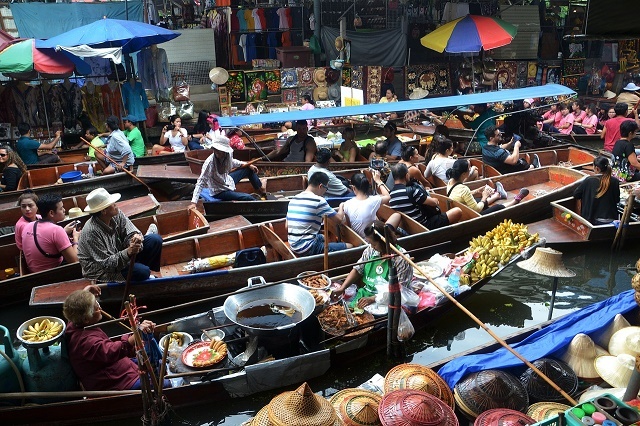 Thailand is one of the countries hit hardest by the credit crisis. Despite this, the country remains home to some of the wealthiest expats, with 94% of those living there not even considering a return to their homeland. Ranking 15th in HSBC's Expat Explorer Survey 2009, along with other more developed economies like Japan and Middle Eastern countries, when it comes to quality of life of expats, Thailand proves that it is an ideal place in which to relocate. It is more than those majestic blue skies, crystalline waters and paradise-like beach resorts that make them want to stay. Most stay in Thailand because it gives them the opportunity to live a life of luxury they could only dream of in their home country. Generally, an expat coming from either the US or Europe would have sufficient money to live a well-off life for two to three years if they move to a less-developed country, like those in Southeast Asia, including Thailand, where the cost of living in all aspects is far less. One thing's for sure: With good money habits, an expat won't go hungry in Thailand. On average, you will spend about THB (Thailand Baht) 5,000 or USD (US Dollar) 150 on groceries including important food items like fruits, vegetables, and meat. Being a highly agricultural country, Thailand offers numerous choices when it comes to raw food and you can get these at a lower price in community markets or fish ports (or you could take a ‘longtail' and try out the floating markets!). Eating out is also not much of an expense, but like everywhere it depends on the type of restaurant you choose. Meals in high-end restaurants cost about USD 10 to 15. A decent meal in one of the local haunts would definitely be cheaper. Of course, there are the Thailand hawkers, spread out in any place frequented by people in the cities, selling every delicacy from fruits to salads, sausages to Indian rotis. Eating on the streets also gives you the opportunity to practice your Thai, as you can easily strike up a conversation buying street food from vendors. Cheap clothing is also something that an expat can have in abundance. The best deals on clothes are found in flea markets, but for branded items make a trip to the city shopping centers. Accommodations in cities like Bangkok cost a bit extra, but are more convenient if you are looking for easy access to city life. Apartments or condominium units cost around USD 200 monthly. Cheaper options are available, but are mostly found in places or towns a little further from the city. Getting around the capital is easy and inexpensive. Although petrol is generally cheaper at about USD .60 or 20 Baht, buying your own car does not come recommended as the traffic on the streets of Thailand, especially in Bangkok, is heavy and congested on a daily basis. You can always take buses, which frequent Thai major thoroughfares. You can choose between air-conditioned and non air-conditioned buses and the fares range from 20 to 30 Baht. If you are in a hurry, then you can either take the Skytrain or the MRT. Thailand's train system has greatly improved in recent years and routes are generally the fastest way around the city. Nothing in life is free; but in Thailand, you can experience life in an Asian paradise at a more affordable price.